The agony of losing a child: For Dominic Young Jr. and others taken too soon. When I get a call at 2 o'clock in the morning and the sergeant of homicide tells me a child has been killed or a young child has been hurt and is in the hospital, my heart just drops. My son was 26 years old when he was murdered and I’ve never gotten over it. But when a child, who has not even gotten to the teen years, is shot or otherwise killed, that breaks my heart. So when that happens, the first person I look for is the mother. I know she needs a hug from me. I need to give her that hug because I know where her heart and her mind is at right now. You just just can't process at that time. You're just stuck. When you bring a child into this world that's pain that you can't describe. And when that child is taken away senselessly like that, that's more pain that you can't describe. I work closely with the family. I want to advocate for the mom. She needs a voice to be there for her. When a child dies, the mothering instinct kicks in. She wants her baby taken care of, but she doesn't know how to do that. We don't know how to bury a child. It's senseless, so senseless. But one thing you want... “I want to see my baby.” That's what I hear from the moms. And as a mother myself, I know. When you work closely with families and that mother, you see how people kind of run circles around them. I'm not saying it's intentional, but it happens. Sometimes we want to make it about the adults instead of about the child. We need to get back to thinking about the child, because the community needs to be angry and frustrated and tired because little babies are being killed for no apparent reason. Then you think about the people that committed this crime. Do they even care? Who is responsible? We as a community are responsible for taking care of our children. I think about that little boy, Dominic Young Jr., the boy who was killed near 71 Highway in a drive-by shooting. People will say, “Oh, God called that child home." No, God didn't. Murder is not an act of God. That child will be in the arms of God, but God does not call his children home with gunfire. I'm going to talk about this. We failed Dominic and we failed many other children. This community allowed that child's life to be shortened. And we're still silent today. What is it going to take? How many children do we allow to be killed in our community by gun violence? We need people to speak out and face these perpetrators down, because they are cowards. When we get bold enough, we will push them out of our community. Here in Kansas City, where I was born and raised, we are crying out for help. It's going to take some of us with the courage to stand and come together. It's like the preacher said at Dominic's service. He said, "y'all want to say that black lives matter. Yeah, black lives matter, but we don't make them matter.” I wanted to shout out in the church, because he is right. 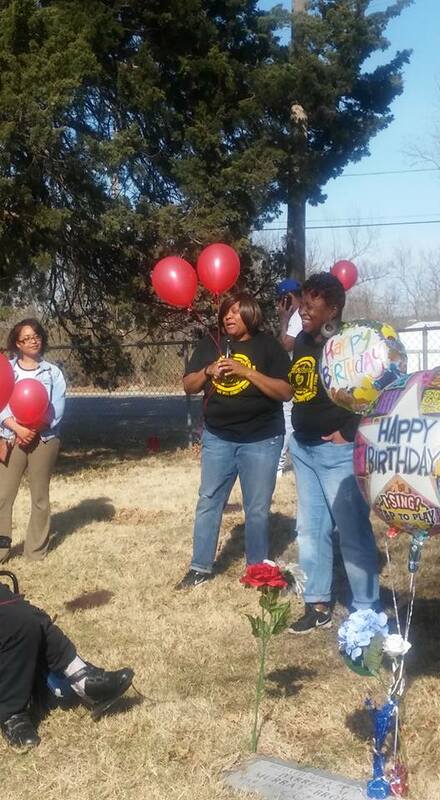 On March 18 we got together at Blue Ridge Lawn Cemetery for the birthday of my son, Darreon Murray. You know, it was kind of bittersweet. On March 7 it was eight years since he was killed. I didn’t do anything to observe that. Then came his birthday. It’s hard to rebound from the 7th to the 18, but I decided to have a birthday celebration to celebrate Darreon’s life and his memories and have my family and friends come together. It’s hard for them just like it’s hard for me. So we gathered at the cemetery where he’s buried. We went over some of the memories, some of the good times, some of the crazy things he would say and do. We talked about missing him and we just kind of came together as a family. Darreon, he was very open to people. He loved being around people. He was just kind of laid back, the class clown. He was a pretty good kid, I never had any trouble with him. He was respectful of his elders and very, very well mannered. He loved basketball. He’d been playing since he was 3. He played for Hogan Prep for four years. He played all summer. He played for the YMCA, all the summer leagues. Basketball was his life. He had so many trophies. But that wasn’t why he wanted to go to college. He had several scholarship offers, he wanted to study architecture. He hadn’t said anything but I think he was working to get his scores up so he could go to MU. That’s a big reason why my daughter went to MU. The day of the celebration it was nice and sunny. We released 26 red balloons, because that’s how old Darreon would be. I had bought a extra balloon that sings Happy Birthday when the wind blows. We had cupcakes --with red icing and emojis. There were maybe 25 people there. It was a nice crowd. I felt a kind of peace come over me. It felt real good ‘cause I told him I wasn’t gonna be sad on that day. I said, we gonna celebrate like he’s here. On this one day, we’re not gonna be sad.